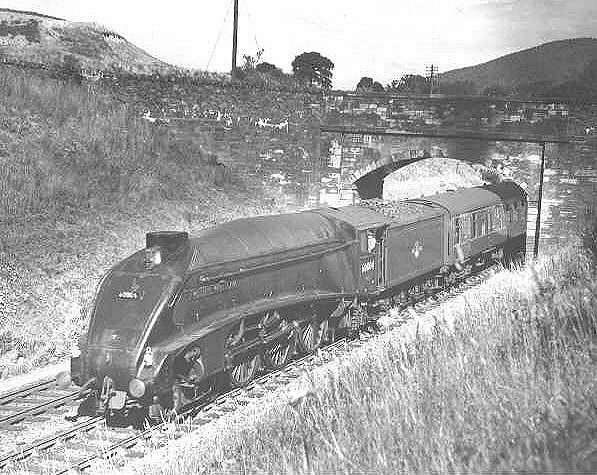 Class A4: BR 60004 "William Whitelaw" at an unknown location, probably on the East Coast Main Line near Edinburgh. The locomotive was allocated to Edinburgh Haymarket shed (code 64B). This loco was built at Doncaster as works number 1864 in 1937. Originally she was LNER 4462 "Great Snipe". 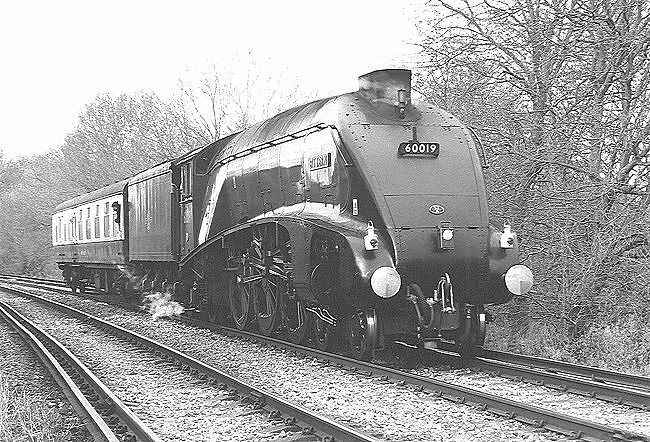 Following a change of name to "William Whitelaw" she became LNER 4, and following nationalisation became BR 60004. She was withdrawn in 1966. 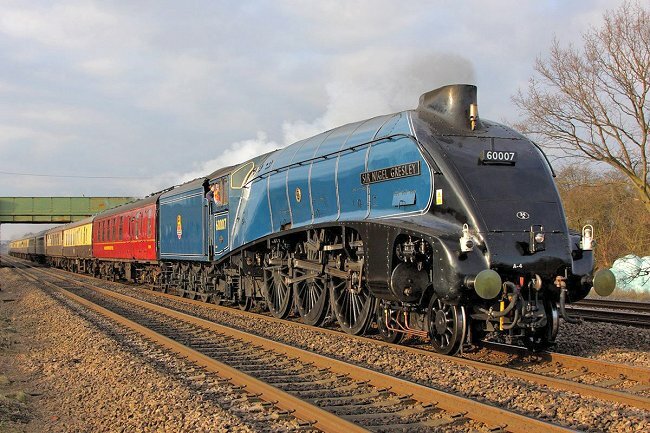 Class A4: BR 60007 "Sir Nigel Gresley" at Cossington 28th February 2009. Photograph Nick Broome. an unknown location, probably on the East Coast Main Line near Edinburgh. 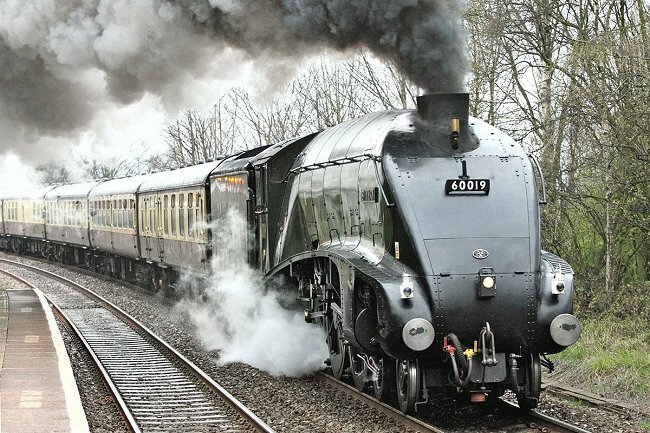 The most famous example of this class is 4468 "Mallard", holder of the steam traction world speed record of 126 mph (203 km/h). 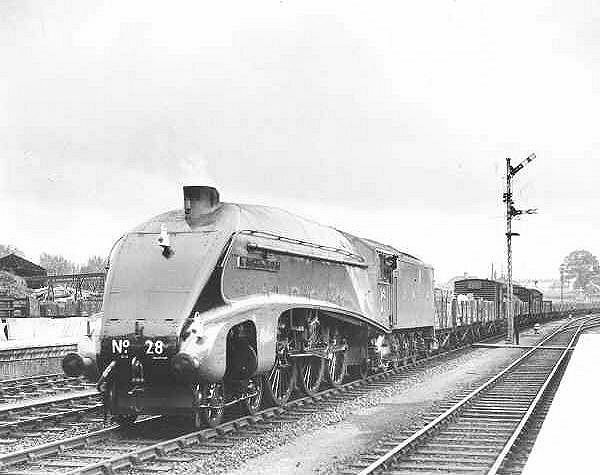 The record-breaking run was down Stoke Bank south of Grantham on the East Coast Main Line 3rd July 1938. Class A4: 60011 "Empire of India" descends Cocksburnpath Bank approaching Penmanshiel Cottage at milepost 39. The train of BR Mark 1 coaches is the 11.0 am Edinburgh Waverley to London Kings Cross. The locomotive was from Edinburgh Haymarket shed (code 64B). The location is grid reference NT 796683. This loco was Doncaster works number 1855 of 1937 and entered traffic as LNER 4490, later becoming LNER 11. She was withdrawn from traffic in 1964. 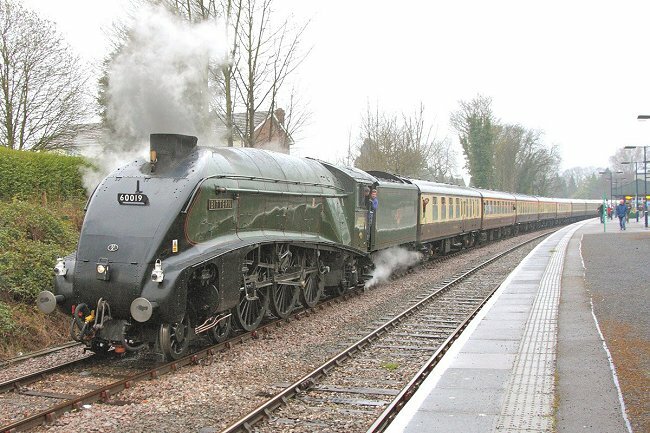 Class A4: 60019 "Bittern" at Old Hill 19th April 2008. Photograph Nick Broome. 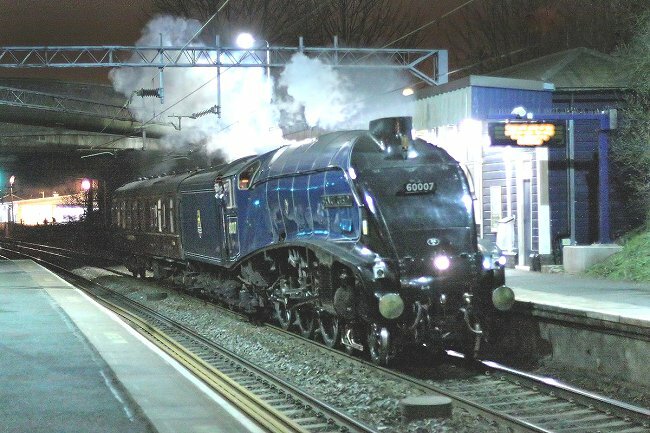 Class A4: ex-LNER 60007 "Sir Nigel Gresley" passes through Hamstead station 28th February 2009. Class A4: LNER 28 "Walter K Whigham" (formerly 4487 "Sea Eagle") from Grantham shed hauling a goods train. The location is Princess Risborough. This locomotive was built at Doncaster as works number 1852 in1937. She entered traffic as LNER 4487. 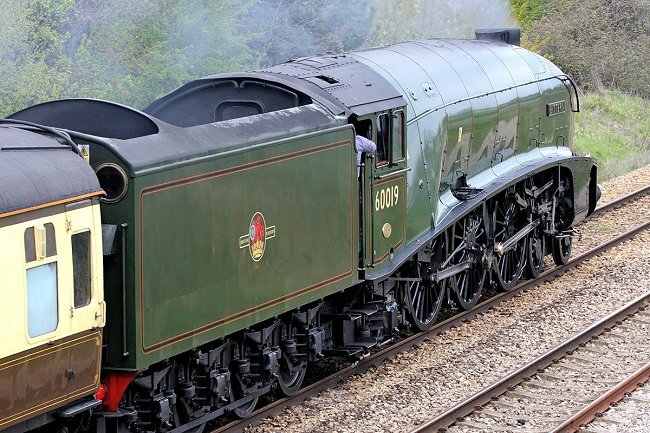 In BR days she became number 60028 and was withdrawn from service in 1962. The wedge shaped streamlined casing was inspired by the R101 airship, the Bugatti high-speed railcar and the German "Der Fliegende Hamburger" (Flying Hamburger) on the Berlin - Hamburg trains. 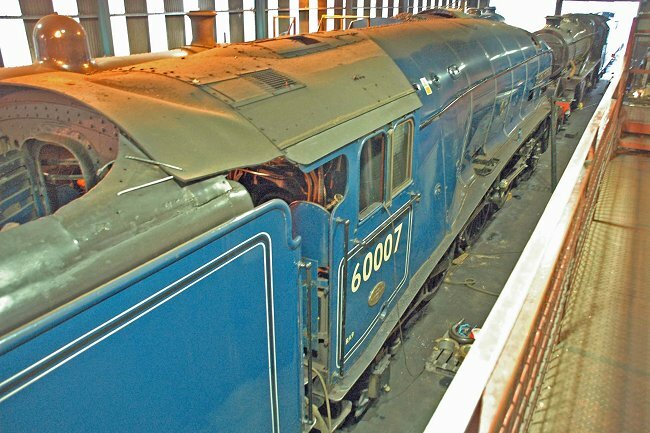 Class A4: BR 60007 "Sir Nigel Gresley" on shed in 2010. Photograph Mark Jones. 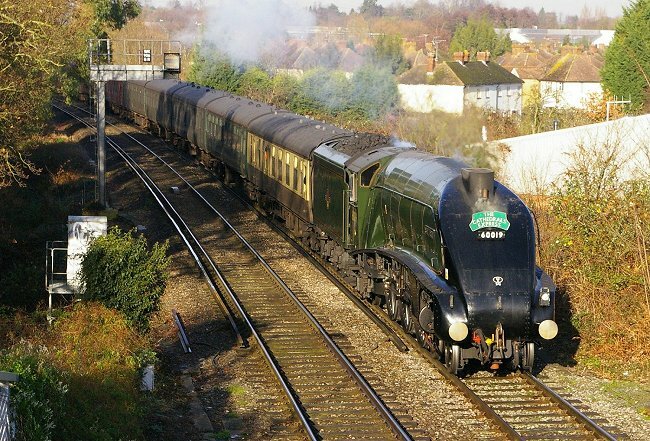 Class A4: BR 60019 "Bittern" hauls train 1Z82 "The Cathedrals Express" from London Victoria to Bristol temple Meads pas Coxes Mill as it approaches Addlestone Junction 1st December 2009. Class A4: BR 60019 "Bittern" approaches Byfleet Junction from the Virginia Water direction with a single carriage forming train 5Z50 from Southall to Alton 3rd march 2008. Class A4: BR 60019 "Bittern" at Dorridge 19th April 2008. Photograph Nick Broome. LNER Gresley Class A4 Pacific 4-6-2 Steam Locomotive: Weight Diagram. 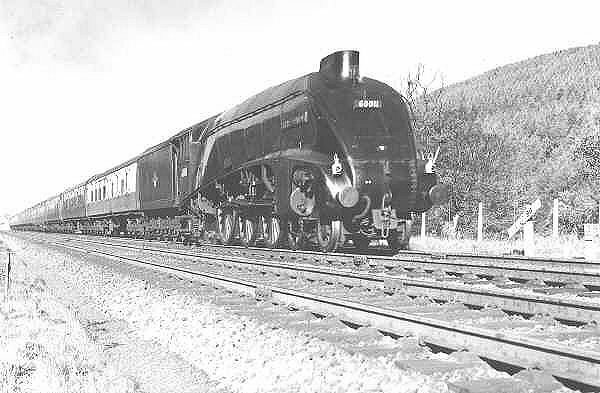 Note the corridor tender which enabled these locomotives to work long distances non-stop. 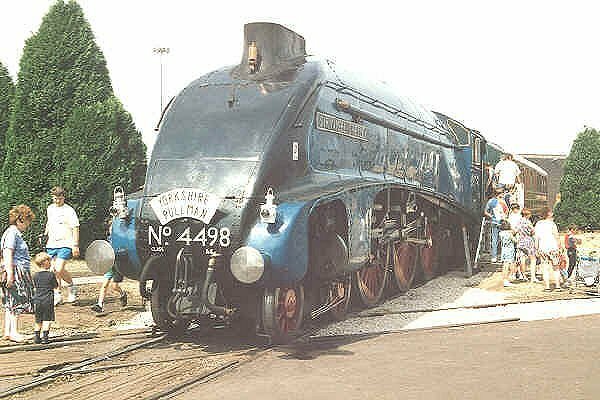 Class A4: LNER 4498 "Sir Nigel Gresley" on display at Doncaster 10th July 1994. Class A4: BR 60019 "Bittern" at Droitwich 19th April 2008. Photograph Nick Broome.